BRUNCH. The time has come. Let’s do this, friends. I have mucho recipes coming your way just in time for your spring and Easter gatherings and all the sunny-bright-happy days ahead. Can you sense my enthusiasm for this most epic meal of the day? I can’t hide it. I love brunchy breakfast food. I love excuses to eat breakfast food at non-breakfast times of the day. And also, I’m obsessed with eating savory food for breakfast. Last night’s spaghetti for breakfast? Yes please! Pancakes and eggs for dinner? Don’t mind if I do! Breakfast and dinner should just switch places. Muscle Mealtime confusion. It’s a new term. Fun fact: When not eating blog recipe leftovers for dinner, my go-to evening meal is an over-sized egg white omelet stuffed with cheese and whatever veggies I can scrounge up from the fridge. We may or may not have this dinner 3+ times a week. 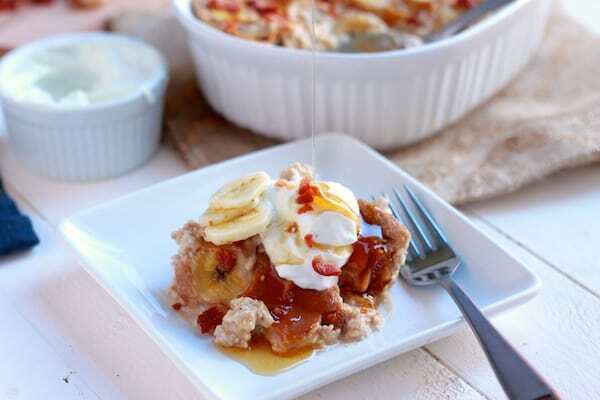 Let’s start this Spring Brunch off right with this Peanut Butter, Banana, and Bacon Baked Oatmeal recipe, combining the most tantalizing sweet and savory flavors. It’s a nod to the Elvis sandwich, because IIIII caaan’t help…..falling in looove. wiith. BACON. Yup I had to bring the bacon to the party because bacon paired with sweet things gets me all shook up. 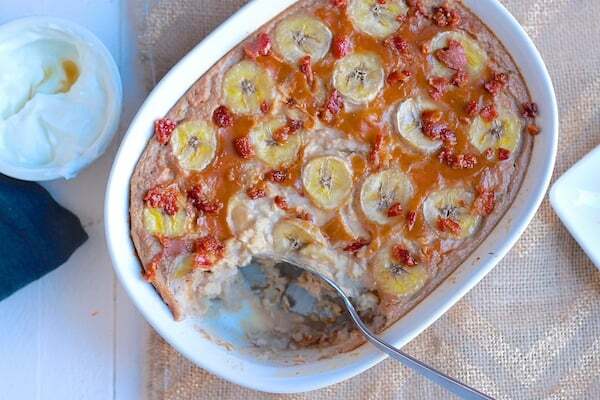 It’s a great way to use up those super ripe bananas. The texture is so thick and creamy, making it a hearty and filling dish. For the peanut butter part of this recipe, I used PB2 aka a life-changing food find. Ever heard of powdered peanut butter? It’s basically finely ground peanuts with the fat removed. Mix the powder with water and in seconds, you’ve got creamy, decadent peanut butter for a fraction of the fat and calories. Powdered peanut butter is popping up everywhere these days –at my local grocery store, Target, Walmart, and Costco. And you can also buy it online. I scored a great deal on Groupon a few months ago. Don’t have powdered peanut butter? Just use regular peanut butter or any nut butter. There’s no added sugar! Aside from any sugar in the peanut butter ingredient you’re using and the natural sweetness from the bananas, there’s no need for extra sugar. Score! The leftovers are just as amazing. For breakfasts all week, I portioned out the remaining servings, topped with a 1/3 cup nonfat Greek Yogurt and a ton of mixed berries for an easy, filling meal to start to the day. Yes, I ate the oatmeal cold and it was just as good! Think overnight oats. Thank you Elvis for inventing this insane flavor combination (and for singing “Suspicious Minds.” It’s my fave Elvis song). 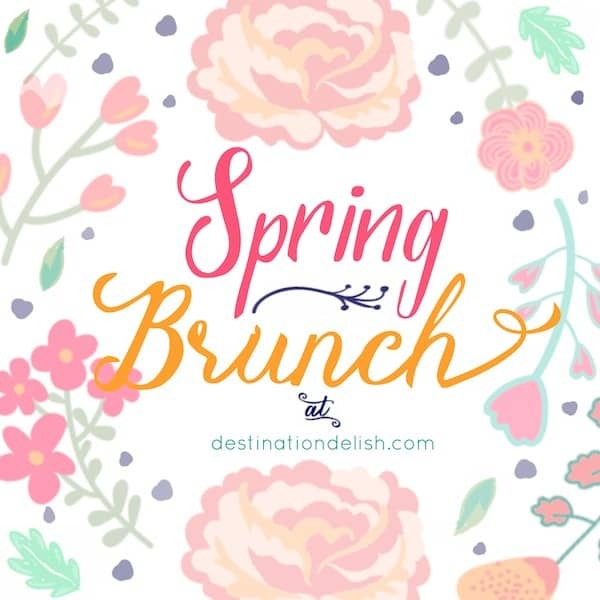 And thanks to YOU for coming to my Spring Brunch! Stay tuned for more sweet and savory Brunch recipes! In a large bowl, combine the oats, baking powder, cinnamon, and salt. 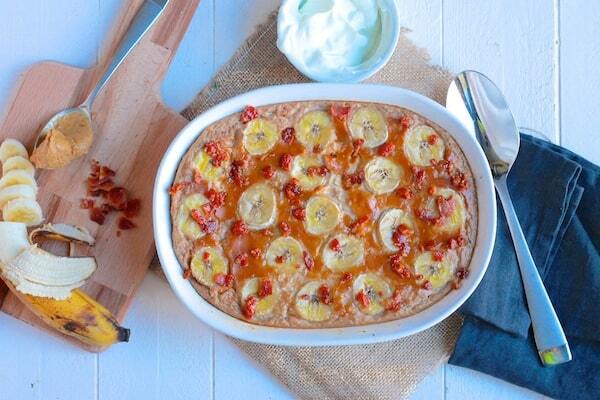 In another bowl, combine the egg whites, almond milk, vanilla extract, and bananas. Add the wet ingredients to the dry ingredients and stir to combine. Stir in half of the bacon bits. Pour the mixture into a baking dish. My dish was 9 x 7. If using powdered peanut butter, mix the powder and water in a small bowl, stirring until it forms a thick and creamy mixture. Skip this step if using regular peanut or nut butter. 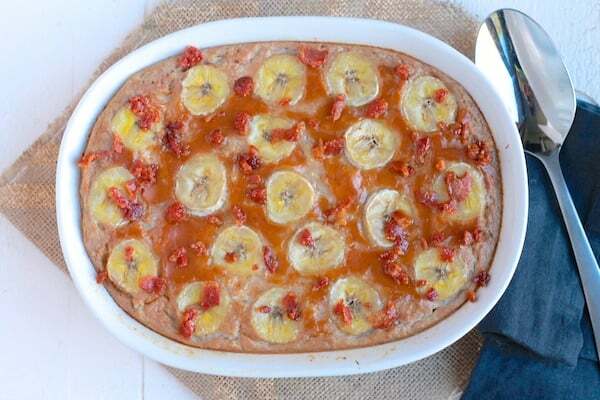 Drizzle the PB2 over the mixture in the casserole dish and top the dish with the remaining banana slices. If using peanut or nut butter, drop small spoonfuls over the top of the oatmeal. Place the dish in the oven to bake. In a small dish, combine the remaining bacon bits with a teaspoon of maple syrup. Set aside. At the 20 minute mark, sprinkle the bacon bits over the oatmeal. Bake the oatmeal for another 10 minutes. Serve warm. Top each serving with a dollop of Greek yogurt and drizzle with with maple syrup.